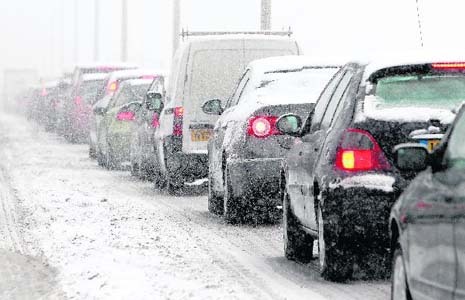 Motorists across the UK have been advised to take extra care whilst driving following a spate of cold weather during the first half of February. The MET Office have issued several severe weather warnings across England and Wales since the beginning of the month, and drivers are now being advised to drive carefully as snow and rain freezes into ice at night. Ice is likely to cause problems on roads and pavements across the country, with southeast Wales and England being particularly affected. Fog patches are also likely to form throughout the cold snap, adding to disruptive travel across the UK. Andy Page, Chief Forecaster at the MET Office said ‘Most showers will fall as rain, which will freeze onto sub-zero surfaces’, adding ‘snow melting and then refreezing on untreated surfaces could also cause disruption’. These conditions follow a chaotic week for travel in Britain. Over half of the 1300 scheduled flights at Heathrow Airport were cancelled following snowfall, and almost 400 transatlantic passengers were left stranded in Ireland overnight after six London-bound flights were diverted. At Stansted Airport, most flights were still operating, but queues in terminals built up after flying schedules became disrupted as a result of the weather. Weather is, however, expected to become milder in the near future across the UK.